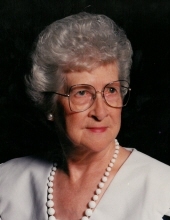 Jeanette Moore Martin, 99 of King’s Grant Retirement Community in Martinsville, VA died Wednesday, November 14, 2018. She was born in the Dyers Store community of Henry County on November 14, 1919 to the late George Daniel Moore and Mary Ann Elizabeth Jones Moore. In addition to her parents, Jeanette was preceded in death by her husband of 64 years, Frank Marshall Martin; twin sister, Geneva M. Eggleston; sisters, Virginia (Virgie) M. Pace, Gertrude M. Pace, Bessie M. Martin, Beatrice M. McMillan; brothers George Daniel Moore, Jr., John Leslie Moore, and Charles Leonard Moore. She is survived by a daughter, Judy Martin Epperly of Martinsville; a granddaughter, Anne Marie Epperly of Newport News, VA; two great grandsons, Martin David Zwergel and Joseph Thomas Zwergel of Newport News. Jeanette and her husband Frank were founding members of Chatham Heights Christian Church where she taught Sunday School and sang in the choir. For many years, Jeanette and Frank raised flowers that she arranged weekly for the church sanctuary. Jeanette was a homemaker for much of her life and later retired from the Henry County Treasurer’s office. A funeral service will be held Monday, November 19, 2018, at 11:00 a.m. at Norris Funeral Services, Martinsville Chapel with Minister Dean Ashby, Chaplain Paul Johnson, and the Reverend Libby Grammer officiating. The family will receive friends from 6:00 – 8:00 p.m. on Sunday, November 18 at Norris Funeral Home and other times at the home of her daughter at 211 Thomas Heights, Martinsville, VA. The family wishes to express appreciation to Dr. Will Zimmer and to the King’s Grant staff with special recognition to the King’s Grant Lacy Health Care staff. Anyone who desires to make a memorial contribution may wish to consider Safetynet, Inc., P.O. Box 4482, Martinsville, VA 24115; King’s Grant Fellowship Fund, 350 King’s Way Road, Martinsville, VA 24112 or Grace Network P.O. Box 3902, Martinsville, VA 24115. To send flowers or a remembrance gift to the family of Jeanette Moore Martin, please visit our Tribute Store. And other times at the home of her daughter at 211 Thomas Heights, Martinsville, VA.
"Email Address" would like to share the life celebration of Jeanette Moore Martin. Click on the "link" to go to share a favorite memory or leave a condolence message for the family.